When did the GOP become the party that hates science? Norquist is implying that the Mars mission wasn’t worth it. George Bush’s vendetta war in Iraq is costing us $3 trillion, or 1,200 times the cost of “that picture of Mars” (the Curiosity mission cost only $2.5bn). So, actually, had the Republicans not invaded Iraq on a lie we could have afforded both Mars and Rembrandt. This is something that bothered me way back in 2001. I remember when George Bush was proposing the huge $1.6 trillion tax cut, and when Democrats, led by Tom Daschle, immediately caved and countered with a $1.3 trillion tax cut (that’ll show ’em). At the time I thought, yeah we have a surplus thanks to Bill Clinton, but shouldn’t we save this for a rainy day rather than run out and spend it like a drunken Reagan? Yet that’s what the Republicans did, and it’s what they always do. The Republicans never met a surplus they didn’t spend. They wasted America’s rainy day fund on tax cuts for the rich and wars of convenience, and now we’re all paying for it. Of course, it gets even funnier. Had Norquist taken a few more science and math classes he might have had the smarts to Google the photo before sending it out to the world as a new photo from Mars. It’s not a new photo at all. 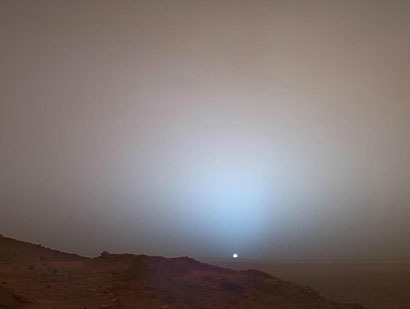 It’s a photo from 2005, and has nothing to do with Curiosity’s current mission to Mars. And Grover, there’s one more difference between the Mission to Mars and the $3 trillion Republican war of convenience in Iraq. The Mission to Mars didn’t kill anyone. PS Oh, and Grover, the pic you’re complaining about was from the Bush administration. But funny you didn’t complain about the cost of the Mars mission, or Bush’s various wars, then.